When I sat my A2 Economics exams in the summer of 2014 at JFS I achieved a C grade in every unit. Several people told me that my ambition to study Economics at university was unrealistic and that I should consider doing something else instead. I’d felt extremely disheartened and was very unsure on what to study at university. A friend of mine who had done extremely well told me that he had been tutored through Expert Tuition and had also attended their revision courses, so I got in touch and decided to re-take all four papers in my gap year. As you can see from the photo, I went from a C to an A*! This transition shocked my friends, family, but mostly my teachers at JFS, who had let me believe that I wasn’t capable of this. This enormous change was due to Expert Tuition’s tutors, their revision programmes. A huge factor was how much Ahmed (one of the directors of Expert Tuition) helped me and spent time rebuilding my confidence and took great care in ensuring I was progressing well during my gap year. I feel a huge amount of gratitude to Expert Tuition for helping me prove my doubters wrong and I’m excited for my future, and studying the subject that I love at university. 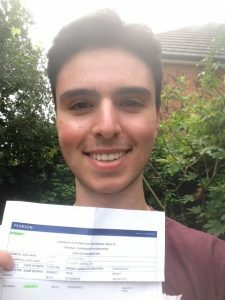 I’m now really excited about attending university and I’m confident I can do well on a tough course (Maths with Economics at Sussex University) – whereas last year I couldn’t see what degree I would be doing and how I would manage, considering my A Level results had been poor. Thank you so much!